Dr. Timothy Harlan is a physician and chef who has helped thousands of patients to achieve their weight loss goals. His book, Just Tell Me What To Eat, approaches dieting from the perspective of what you can eat instead of listing forbidden foods. He provides dieters with a solution to weight loss in the form of a prescription of the foods to eat, when to eat them, how to prepare them and why these foods will improve your health. This program is a six-week medically based weight loss plan that includes nutritious foods and is based on the Mediterranean Diet. Dr. Harlan’s approach emphasizes the importance of creating optimal health through nutrition and this involves selecting “high quality calories” and home-prepared meals. You are encouraged to focus on nourishing foods rather than paying too much attention to their content of protein, carbohydrates or fat. Guidance is provided each day with health and nutrition lessons, a menu and easy recipes. For example, the lesson for the first day teaches you what to eat for breakfast and explains the benefits of eating breakfast for weight loss. You are also provided with a menu for lunch and dinner, which includes a recipe for a healthy version of Fettuccine Alfredo. Suggestions are also offered for healthy meals on the days you don’t feel like cooking. Harlan regards taste as being equally important as nutrition so the meals are designed to satisfy the taste preferences of most dieters. Some of the foods included in the plan include pizza, oven-fried chicken and chocolate cheesecake. When you get to the end of Just Tell Me What To Eat, you will have dramatically changed your eating habits and naturally reduced your weight. Fruit, vegetables, whole grain bread, whole grain cereal, oatmeal, brown rice, pasta, lentils, garbanzo beans, pinto beans, peanut butter, almonds, walnuts, nonfat yogurt, low fat cheese, eggs, salmon, tuna, shrimp, turkey, lean ham, mushrooms, reduced-fat mayo, mustard, olive oil, red wine. Just Tell Me What To Eat doesn’t include a specific exercise plan, but you are encouraged to exercise for thirty to forty minutes a day, five days a week. Any activity that you enjoy is suitable and some of those recommended include walking, jogging, swimming, cycling, aerobics, weight lifting, Pilates and rollerblading. 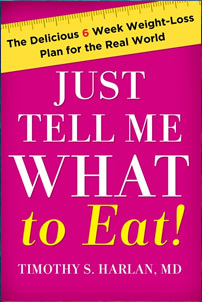 Just Tell Me What To Eat: The Delicious 6-Week Weight Loss Plan for the Real World retails at $25.00. Encourages the intake of a wide variety of healthy and unprocessed foods. Based on familiar foods including healthier versions of favorite “comfort foods”. Gradually educates dieters about healthy eating over a six-week period. Mediterranean diets can reduce the risk of heart disease and diabetes. Includes options for convenience meals and eating in restaurants when you don’t feel like cooking. Just Tell Me What To Eat Provides a six-week meal plan and eighty recipes. Author is a medical doctor and chef. Does not contain a great deal of flexibility in the meal plan. A vegetarian meal plan is not provided. Does not include an exercise program. This weight loss plan is suitable for dieters who require guidance in healthy eating but don’t want to give up their favorite meals. Just Tell Me What To Eat includes healthy variations of familiar comfort foods that have been adjusted to conform to the guidelines of the Mediterranean Diet, which has been shown in scientific research to promote weight loss as well as improvements in general health. Harlan, T. S. (2012). Just Tell Me What to Eat! : The Delicious 6-Week Weight-Loss Plan for the Real World. Da Capo Press.